Things at Best Buy are definitely not turning around as quickly as the company would like. 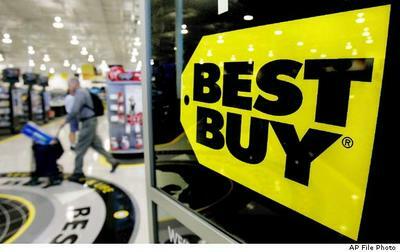 Best Buy released the quarterly report this morning for the second quarter of its 2013 fiscal year, and it wasn't exactly cheerful. Net profit dropped by 90 percent as the company was faced with restructuring charges and weaker than expected sales. It earned $12 million in profit for the quarter compared to $128 million in the same quarter a year ago. The biggest hit came in the international stores opened at least 14 months that saw an 8.2 percent decline in sales, while the locations in the U.S. took a hit of 1.6 percent, resulting in an overall decline of 3.2 percent. The company did say it saw growth in the sales of appliances, e-readers, mobile phones and tablets, but declines hit them in digital imaging, gaming, notebooks computers and televisions. Considering how much floor space is dedicated to the televisions in a given Best Buy location, a hit in that department is sure to bring the stores down fairly quickly. Hubert Joly was announced as the new CEO of Best Buy yesterday, and the hope is that he will be able to turn things around for the struggling retailer, but it looks like he has quite the battle ahead of him. Shares of Best Buy stock hit a nine-year low today on the announcement of the quarterly results. MINNEAPOLIS, August 21, 2012 — Best Buy Co., Inc. (NYSE: BBY) today announced GAAP net earnings from continuing operations were $12 million, or $0.04 per diluted share, for the three months ended August 4, 2012 compared to net earnings from continuing operations of $150 million, or $0.39 per diluted share for the prior-year period. Excluding previously announced restructuring charges, adjusted (non-GAAP) net earnings from continuing operations for the second quarter of fiscal 2013 were $68 million, or $0.20 per diluted share. On August 20, 2012, the company's Board of Directors appointed Hubert Joly, a leading global CEO with expertise in turnaround and growth across the media, technology and service sectors, as Best Buy's President and Chief Executive Officer and a member of its Board of Directors. He is expected to begin his new role in early September. The Domestic segment comparable store sales decline of 1.6 percent was driven by declines in gaming within the Entertainment revenue category, digital imaging and televisions within the Consumer Electronics revenue category and notebooks within the Computing and Mobile Phones revenue category. These declines were partially offset by comparable store sales growth in tablets and mobile phones within the Computing & Mobile Phones revenue category, the Appliances revenue category, and eReaders within the Consumer Electronics revenue category. The Domestic segment online channel revenue grew 14 percent compared to the prior-year period. The International segment comparable store sales decline of 8.2 percent was driven by the lower growth in consumer spending in China and the continued impact from the expiration of government sponsored programs, which negatively impacted sales in Five Star. Market softness in notebooks, digital imaging and home theater in Canada also contributed to the International comparable store sales decline. Domestic segment gross profit decreased 6 percent, reflecting a rate decline of 110 basis points compared to the prior-year period. The Domestic segment rate decline was primarily due to three factors. In mobile phones, connection growth and a mix into higher price point smart phones resulted in strong comp sales and gross profit dollar growth, although at a lower overall rate. Second, industry softness in computing resulted in increased promotional activity in the quarter to stimulate consumer demand ahead of the second half of fiscal 2013, which will include the Windows 8 launch. Finally, there was less favorable product mix within the television category. International segment gross profit declined 9 percent, reflecting a rate decline of 130 basis points compared to the prior-year period. This rate decline was driven by Best Buy Europe and due primarily to increased mix of lower margin wholesale sales and promotional activity within a price competitive environment for mobile phones. Total SG&A spending declined 2 percent compared to the prior-year period as the company executed on previously announced actions to reduce costs through changes in its corporate and field operating models, adjusting labor to match demand and from store closures. As a reminder, year-over-year SG&A comparisons for both Domestic and International segments were impacted by the absence of the Best Buy Mobile profit share payment in fiscal 2013 as a result of the purchase of Carphone Warehouse Group plc's ("CPW") share of the Best Buy Mobile profit share agreement in the fourth quarter of fiscal 2012. These intercompany profit share payments previously increased Domestic segment SG&A expense while lowering International segment SG&A and had no impact on the company's consolidated operating income. Operating income of $33 million included $91 million of restructuring charges primarily related to store closure costs. Excluding these charges, adjusted operating income for the quarter declined 52 percent to $124 million. Please see the table titled "Reconciliation of Non-GAAP Financial Measures" attached to this release for more detail.